CARSON EVENSTAD breaks into the open and races 48 yards for a touchdown in the first quarter of Friday’s game. POSTED October 12, 2018 11:14 a.m.
DARLINGTON – Circumstances have made the Darlington Redbirds football team an old-schooled running team this season. On Friday night, that style of play came in handy as Mother Nature made in difficult to pass the football. 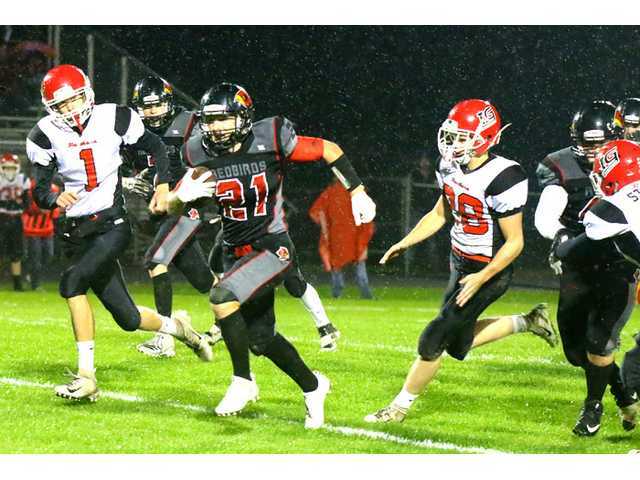 The Redbirds punched in a pair of early rushing touchdowns to build up a 12-0 lead prior to a second-quarter lightning delay, and when play resumed the ‘Birds held on to defeat the Iowa-Grant Panthers, 12-2, in a key SWAL contest held at a rain-soaked Martens Field on Friday, Oct. 5. The win kept the playoff hopes alive for the Redbirds (3-5 overall, 2-3 SWAL) heading into their season finale at Boscobel this Friday night. The Panthers (2-6, 2-3) were looking to clinch a playoff berth with a win over the ‘Birds, but will now need to defeat Cuba City (4-4, 3-2) in their finale to become eligible for the post-season. Iowa-Grant was ready to put everything on the line on Friday night, trying an onside kick to open the game– which they didn’t recover– and then going for it on 4th-and-1 in their own territory on their first possession– which was stuffed by the Darlington defense. Taking over at the IG 48 following the stop, the Redbirds needed just one play to make them pay for their risky decision as senior running back Carson Evenstad raced in for a 48-yard touchdown to put the hosts ahead to stay at 6-0 with exactly eight minutes remaining in the first quarter. The ‘Birds added to their lead on the first play of the second quarter with senior running back Kolbe Ubersox capping a methodical 80-yard scoring drive with a 1-yard TD run to make it 12-0. The teams got an early halftime break when lightning forced a delay with 2:40 remaining in the second quarter. After allowing the team to listen to the end of Mineral Point’s thrilling 14-12 victory over previously unbeaten Fennimore on the radio, Winkers treated the rest of the delay like a regular halftime break. “We kept them relaxed. We made our adjustments and came out ready to play,” Winkers noted. The Panthers picked up their initial first-down of the night on their first drive back following the delay, but the ‘Birds stopped their promising drive on downs and ended the first half up 12-0. With the rain falling heavy at times, neither team could generate much of an attack on offense as each put 10 players inside the box on defense to stop the run and dare the other to pass. “It was sloppy conditions for both teams. Both quarterbacks struggled to complete even a short pass. It was all ground-and-pound with 10 guys in the box,” explained Winkers. The lone points of the second half came on a safety following a bad snap on a punt attempt by Darlington deep in their own territory. Punter Wyat Bredeson was buried under by a horde of Panther defenders after recovering the snap in the end zone to make it 12-2 at the 4:29 mark of the third quarter. The Redbirds forced two turnovers and two other turnovers on downs in the final 16 minutes of play to hang on for a 12-2 victory. The ‘Birds outgained the Panthers on the night, 211-145, will all their yards coming on the ground on 56 carries behind the line of senior Matt Douglas and juniors Carson Lobdell, Bailey Schilling, Leif Bredeson and Marty Williams. Evenstad ran for a game-high 127 yards and a TD on 22 totes to lead the ‘Birds. Bredeson added 45 yards on 11 carries, while Ubersox tallied 38 yards and a TD on 13 carries. I-G quarterback Ross Havlik went just 7-of-28 passing for 59 yards with an interception, and running back Matthew Winders ran for 41 yards on 11 carries for the Panthers. Barry Schliem and Shane Gallagher recovered fumbles for the Redbirds, while Carter Lancaster had several key passes defended and a huge interception late in the fourth quarter to help seal the victory. “Two weeks in a row, the defense has played really well. If we’re going to be a ground-and-pound team, our defense has to keep doing what they’ve been doing to allow us to be successful,” said Winkers. Darlington will cap the regular season by heading to Boscobel on Friday, Oct. 12, to face the Bulldogs () for the final time as conference foes. Kickoff is set for 7 p.m. The Redbirds travel to Boscobel having defeated the Bulldogs in 32 consecutive seasons dating back to 1985. The ‘Birds need a victory on Friday night to clinch a WIAA playoff berth for the 11th year in a row. “We’ve got a taste of winning. We tell our kids all the time that anything can happen in the playoffs. We just have to take care of business next week and we’re in,” Winkers added. Team Stats: First Downs– IG 6, D 9. Rushing– IG 29-86; D 56-211. Passing– IG 7-28-1, 59; D 0-6-2, 0. Fumbles-Lost– IG 2-2; D 3-0. Penalties- IG 2-16; D 4-30. Darlington Individual Leaders: Rushing (Att-Yds-Td)– Carson Evenstad, 22-127-1. Passing (Comp-Att-Int-Td-Yds)– Davis, 0-6-2-0, 0. Receiving (Cat-Yds-Td)– None.